I'm not one to give up on epic quests, and one of the first things I did after reading A Storm of Swords, the third book in the fantastical series A Song of Ice and Fire, was to download the next book on my Kindle. I had been warned, however, that unlike the brilliant third instalment in the series, A Feast for Crows was too long, too slow and clearly not as much fun. I'm not going to dabble in the series of events going on in Westeros, however, I will warn anyone who has gotten this far through the 1k-pages-per-volume saga that A Feast for Crows will disappoint in terms of excitement, characters and action. The reason I liked A Storm of Swords in the first place was that it seemed to be going somewhere. And then at the end it truly wrapped up its plots in satisfying and surprising ways. All characters had enticing arcs and I felt a sense of purpose in the prose; Martin was going somewhere with the intricate explanations of a fantasy world in turmoil. A Feast for Crows seems to be a polar opposite of all this. The plot advances at a truly glacial pace during some parts of the book, and the ending seems for nought. A pet peeve of mine is present here as well. I've read too many novels and seen too many movies, where the main character goes through an exaggeratedly complex series of events, fighting to prevent whatever disaster is currently imminent, only to be outdone at the very last moment. It seems to be some kind of contemporary twist on the Deus Ex Machina ("it was only a dream", etc.) made for a world of zombie apocalypses and The Da Vinci Code. It was also present in Dan Brown's Inferno (more on that later), and now it is here in A Feast for Crows. 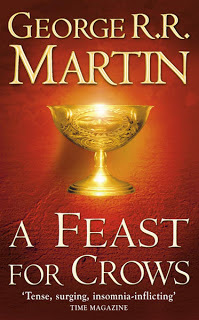 If you previously loved A Song of Ice and Fire for its intricate plotting, enormous family trees and minute details of a fantasy world, you will be right at home with A Feast of Crows as well. Alas, if you previously enjoyed the feeling of unstoppable machinery stirring into motion and taking characters from remote parts of the world together to an epic ending, you will sorely miss the action, drama and irreversibility of the previous novel. A Feast for Crows, a surprisingly accurate name, is great pickings, but only for a certain breed.